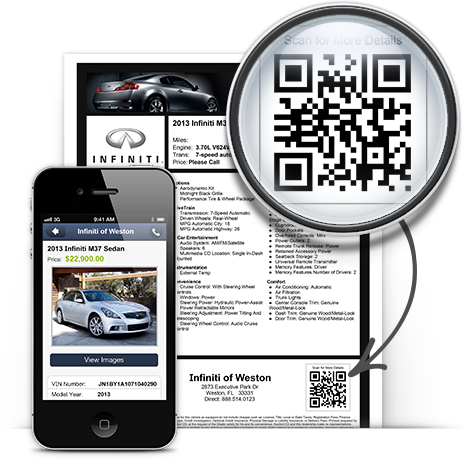 How Are You Using QR Codes at your Dealership? Auction123 has offered window stickers integrated with QR codes for some time now. The real question is, are the customers using them? In many examples of QR code marketing, the scanned code is not directing the potential customer to a sensible website or landing page. More often than not, QR codes are directing potential customers to a company’s full website. The problem is, most of the popular smart phones do not support Flash based web design, which is used on an estimated 50% of the world’s most popular websites (and most likely on yours too). When considering QR code marketing, bringing your customer to a mobile friendly page with information that makes sense with the code scanned is the way to go. Our Auction123 QR code window sticker functionality directs the “scanner” to a mobile vehicle presentation of the exact car that has sparked their interest. How are you using this technology in your dealership? Let’s face it, most people shopping on your lot will not have the app downloaded to scan a QR code. Some may not even know what the QR codes mean! The real question is, how does you shopper know the benefit of scanning the code if your sales team isn’t discussing it with them? In many scenarios, the marketing use of the QR code is all dependent on if the target audience performs an unprovoked action. However, in your dealership, the sales personnel can start using the QR code as a way to connect the shopper with the vehicle. When faced with the ever common need to “sleep on it”, a sales representative can offer a great way for the shopper to keep looking at the vehicle from home. Download the free scanner and walk the customer to the car to scan the code. That’s the perfect time to explain they will have access to all the photos, specifications, and tools on the mobile vehicle presentation. If the customer is opposed to downloading the app, scan the QR code for them and text or email the link. Remind the prospect they can now access all inventory on the lot from the mobile inventory showroom, in the event they have been eyeing additional vehicles. The QR code can also be used by dealership personnel as a way to quickly access your mobile inventory showroom and show customers additional inventory in stock. Start using the QR code window sticker as an “in-house” sales tool and let us know your feedback! Did you know that lowering your Reserve Price on your eBay Motors National listings is a proven way to boost the final bid price and increase the number of bids you receive? Auction123 provides an easy way to automate this process so you can lower the Reserve Price (“tickle your listing”) on a set schedule for all your National listings. eBay’s studies have found that tickling your listing at least two times during your 7 day Auction will generate more interest and cause your Bidders and Watchers to take action. Lowering the Reserve (even by a dollar) will automatically send out a notification to your Bidders. Additionally, any Watchers of your Auctions will see a notification on their eBay account that your listing experienced a drop in the set Reserve Price. Scheduling your Reserve to be automatically lowered can generate five to six more bids per listing and will increase the probability of your Auction’s success by 50%! To locate this setting within your Auction123 Dashboard, navigate to the Preferences Menu along the left-hand side of the dashboard and click on Account. Click on the eBay tab and expand the Auto Lower Reserve section on the bottom of the window. Check the Enable Auto Lowering Reserve box and set the start time and frequency for your listings to be lowered. Once set, click Save All. All members of Auction123’s Sales and Support teams are Certified eBay eDealer Consultants and are happy to assist with any questions you may have regarding eBay best practices and selling strategies. If you are just getting started or getting back into utilizing eBay Motors to sell units and generate leads, ask about our discounted eBay listing packages. The Auction123 Image Management System allows you to apply a watermark to all images that are imported or uploaded to your Auction123 Dashboard. Many of our dealers utilize this feature to brand their dealership name and/or logo while maintaining security over their vehicle images. We have added functionality to this feature by including the option to only display the watermark on the first image of each vehicle in your Dashboard. Navigate to the Auction123 Image Management System by clicking on an image within the data grid or within the Preview & Edit/Review& Launch view. Click on the Global Watermarks tab within the top navigation menu. Upload and Select the watermark to be displayed on your vehicle images. Select the Only First Image option above the watermark preview screen. Please contact our Customer Support department if you have any questions regarding our watermark settings screen or questions on any aspect of the Auction123 system. eBay has increased the number of characters they will accept in the Seller Provided Title field from 55 to 80. Your eBay Seller Provided Title is very beneficial to your ad as all text within this field is searchable. During the creation of your eBay listing within the Auction123 system, we will attempt to automatically populate this field with a keyword rich Title. To take advantage of the increased character limit, you can edit the eBay Title within your Dashboard by adding up to 80 characters within this field. Be sure to edit the Title prior to listing your vehicle on eBay. If the vehicle is already live as a National Listing, you can edit the sub title if the vehicle does not have any bids. If the listing is a live Local Market ad, you can edit the title if the vehicle does not have any pending offers. Click Here to learn more about this change. You can revert the most recent pricing adjustment anytime. Navigate to the Bulk Actions link within the left-hand menu of your Auction123 Dashboard. Upon clicking Revert Price Adjustment, you can review all vehicles that will be affected by the reversing of the last adjustment. The new values for the pricing fields will be displayed in this view. You can easily remove your Import Field Locks on a global scale. Auction123 offers a seamless integration between your vehicle inventory and eBay Motors. You can manually launch a listing to eBay Motors or have your entire vehicle inventory uploaded nightly to eBay Local Market. All the tools and information needed to list and manage your vehicles are within the Auction123 system, so you never need to sign on to eBay Motors again. Auction123 can support your eBay ads for just $9.95 per listing. For those looking to list more units on eBay Motors and other sites like Craigslist, Facebook, AutoTrader, and more, we have a wide variety of packages to choose from. See firsthand how easy it will be using Auction123. Call (888) 514-0123, Option 3 to set up an online presentation with one of our experienced dealer consultants. Automated Bidder Contact Information (name, telephone number, email address, city/state). Easily insert YouTube video into any eBay listing. Listing Scheduler allows for launching of vehicles to eBay Motors at any time. Advanced VIN decoder automatically pulls 150-200 OEM specs and features by reading an automotive VIN number. Add up to 300 automatically resized photos to each listing. Auto Lower Reserve functionality allows you to set exactly when you want the Reserve on your auctions to be lowered by $1 automatically, a proven way to generate more leads! Dynamic template designer offers unlimited layout combinations with over 30 different colorful options allowing for unique branding. 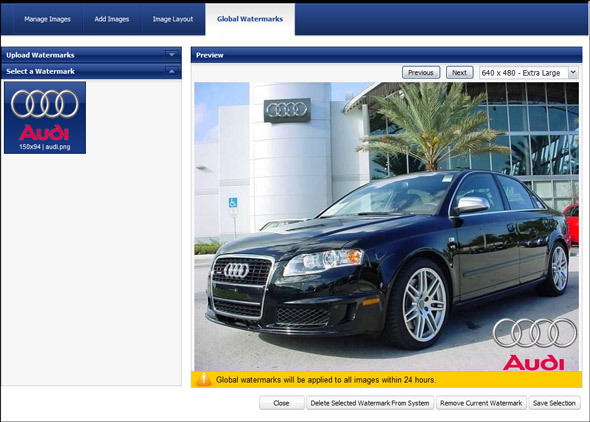 Display your eBay Motors Inventory professionally by using Auction123’s highly detailed eBay Motors store integration. Drive traffic to all of your listings (including inventory not listed on eBay) with the Similar Vehicles showroom within your template. Give your customers the ability to receive instant shipping quotes with a uShip Shipping Estimator. Automated Keyword Generator allows you to make the most of your searchable Seller Provided Title. Shoppers can review the CARFAX vehicle history report or AutoCheck report integrated within your eBay listing. All listings through Auction123 will display a neon green border around the thumbnail image in eBay search results. By effectively utilizing the Bidder Contact Information Auction123 provides, you can sell multiple vehicles from just one listing. Learn how to effectively market your inventory today from an Auction123 Sales Representative.